Suns may set and rise again. For us, when the short light has once set, remains to be slept the sleep of one unbroken night. Gaius Valerius Catullus (c. 84 – c. 54 BC) was a Roman poet, the dominant figure among the New Poets (neoterici) of the 1st century BC. Quotations in English are taken from The Poems of Gaius Valerius Catullus, trans. Francis Warre Cornish (Cambridge University Press, 1904), unless otherwise noted. To whom am I to present my pretty new book? To whom am I to present my pretty new book, freshly smoothed off with dry pumice stone? Mourn, ye Graces and Loves, and all you whom the Graces love. My lady's sparrow is dead. Et quantum est hominum venustiorum. Mourn, ye Graces and Loves, and all you whom the Graces love. My lady's sparrow is dead, the sparrow my lady's pet, whom she loved more than her own eyes. Whom dearer than her eyes she loved. Now he goes along the dark road, thither whence they say no one returns. Let us live, my Lesbia, and love, and value at one farthing all the talk of crabbed old men. Suns may set and rise again. For us, when the short light has once set, remains to be slept the sleep of one unbroken night. You ask how many kissings of you, Lesbia, are enough for me and more than enough? Ipse qui sit, utrum sit an non sit, id quoque nescit. What he himself is, whether he is or is not, he does not know so much as this. Ah, what is more blessed than to put cares away, when the mind lays by its burden, and tired with labour of far travel we have come to our own home and rest on the couch we longed for? This it is which alone is worth all these toils. He seems to me to be equal to a god, he, if it may be, seems to surpass the very gods, who sitting opposite thee again and again gazes at thee and hears thee sweetly laughing. LI, lines 1–5. Cf. Sappho 31. Idleness ere now has ruined both kings and wealthy cities. What is given by the gods more desirable than the fortunate hour? Multi illum pueri, multae optavere puellae. As a flower springs up secretly in a fenced garden, unknown to the cattle, torn up by no plough, which the winds caress, the sun strengthens, the shower draws forth, many boys, many girls, desire it. dicta nihil metuere, nihil periuria curant. Henceforth let no woman believe a man's oath, let none believe that a man's speeches can be trustworthy. They, while their mind desires something and longs eagerly to gain it, nothing fear to swear, nothing spare to promise; but as soon as the lust of their greedy mind is satisfied, they fear not then their words, they heed not their perjuries. iustificam nobis mentem avertere deorum. All right and wrong, confounded in impious madness, turned from us the righteous will of the gods. What a woman says to her ardent lover should be written in wind and running water. LXX, lines 3–4. Compare Keats' epitaph: "Here lies one whose name was writ in water." Leave off wishing to deserve any thanks from anyone, or thinking that anyone can ever become grateful. To this point is my mind reduced by your fault, Lesbia, and has so ruined itself by its own devotion, that now it can neither wish you well though you should become the best of women, nor cease to love you though you do the worst that can be done. If a man can take any pleasure in recalling the thought of kindnesses done. It is difficult suddenly to lay aside a long-standing love. If I have led a pure life. I hate and love. Why I do so, perhaps you ask. I know not, but I feel it, and I am in torment. And for ever, my brother, hail and farewell! Wandering through many countries and over many seas I come, my brother, to these sorrowful obsequies, to present you with the last guerdon of death, and speak, though in vain, to your silent ashes, since fortune has taken your own self away from me—alas, my brother, so cruelly torn from me! Yet now meanwhile take these offerings, which by the custom of our fathers have been handed down—a sorrowful tribute—for a funeral sacrifice; take them, wet with many tears of a brother, and for ever, my brother, hail and farewell! And snatched you, brother, O, how cruelly! And so, my brother, hail, and farewell evermore! If anything ever happened to any one who eagerly longed and never hoped, that is a true pleasure to the mind. An admirable poet. No Latin writer is so Greek. The simplicity, the pathos, the perfect grace, which I find in the great Athenian models, are all in Catullus, and in him alone of the Romans. It is just this quality, this clear and almost terrible simplicity, that puts Catullus in a place by himself among the Latin poets. Where others labour in the ore of thought and gradually forge it out into sustained expression, he sees with a single glance, and does not strike a second time. Catullus is a completely sophisticated, urbane poet, and his sophistication is sincere because his emotions were sophisticated. He expresses the spirit and essence of what we call "society". 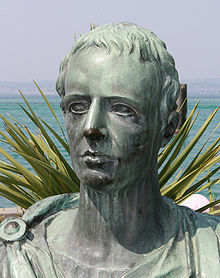 Catullus was the leading representative of a revolution in poetry created by the neoteroi or "new men" in Rome. Rather than writing about battles, heroes, and the pagan gods, Catullus draws his subjects from everyday, intensely personal life. It passes my comprehension why Tennyson could have called him 'tender'. He is vindictive, venomous and full of obscene malice. He is only tender about his brother and Lesbia, and in the end she gets it hot as well. John Platts, in A New Universal Biography (1825), p. 725. The most hard-edged and intense of the Latin poets. Valerium Catullum, a quo sibi versiculis de Mamurra perpetua stigmata imposita non dissimulaverat, satis facientem eadem die adhibuit cenae hospitioque patris eius, sicut consuerat, uti perseveravit. 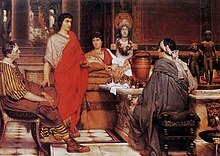 Valerius Catullus, as Caesar himself did not hesitate to say, inflicted a lasting stain on his name by the verses about Mamurra; yet when he apologised, Caesar invited the poet to dinner that very same day, and continued his usual friendly relations with Catullus's father. Tenderest of Roman poets nineteen-hundred years ago.